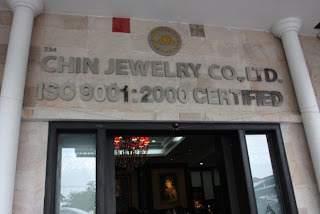 After the river cruise, we go to Chin Jewelry Factory. Anyone who knows me knows that I love my bling, but...I have no intention of buying anything here and if I can't buy anything I don't really care much to look around. So after a few minutes I become very bored. I'm walking behind everyone else in the group looking around, but not taking in much. I'm just trying to be patient till we leave the place. One of the guys who works there is walking behind me and asks where I'm from. He's dressed in a suit, has ruggedy hair and is wearing glasses. He's tall and well-built. He's actually cute! He wants to show me some jewelry in another glass cabinet. "I don't want to see anything," I tell him. "...because I want everything here, and I can't have it," I say. He makes some small talk, and I figure he should rather be helping someone else who's going to actually spend money instead of talking to me - a time waster! ...and then it hits me. Rewind back a few months back when I was in Dubai. I was on a tour and we stopped at a gallery shop. The man who was meant to be showing everyone around, lured me into a private tour and tried his luck charming me. Do you remember Maddy from Kashmir? This feels like a Maddy replay! I think guys who work in places like this see dozens/hundreds (thousands) of tourists and they're expert at seeing who's traveling alone. People traveling alone obviously stand out more. I eventually break away from the Jewelry Cutie and strike up a conversation with my new friends from Singapore. We browse around the souvenir part of the store and I can't help but notice that the workers are extremely unfriendly and unhelpful. I ask a question and they reply me very abruptly. Again, I'm not impressed with the service I'm getting in Bangkok. One of the tour guides asks why I'm alone and then questions further why I don't have a boyfriend. I ask them if I could take their photo. Maybe that would stop their questions. I say to my tour guide, "The man at the hotel said I should give you 100 Baht". He agrees, and I give him the money. Everyone's back in the bus. We're hotel-bound. My two new Singaporean friends and I decide to lunch together. They tell me there are a few Indian restaurants near their hotel. Neither of us have any plans for the rest of the day, and I look forward to a great lunch with interesting people. Bookmarked this. Thank you for sharing. Undoubtedly advantage my time. Wow, you've had quite the experience... seems like a lot of stress and rudeness amid brief spots of politeness and beauty...hope this didn't ruin the trip! As always love the travelog... it's like I'm watching an episode of Globetrekkers...lol!